The building at 340 Jamaica St. in Morro Bay has been an auto repair shop for 36 years. Its newest owner is trying to keep his business while fighting with a neighbor over a conditional use permit. The shop was established before the city of Morro Bay was incorporated, and the shop's previous owner obtained a conditional use permit to change from an auto repair shop to an automotive body and fender repair shop in 1981. The permit just needed to be reapplied for after five years, but that didn't happen. 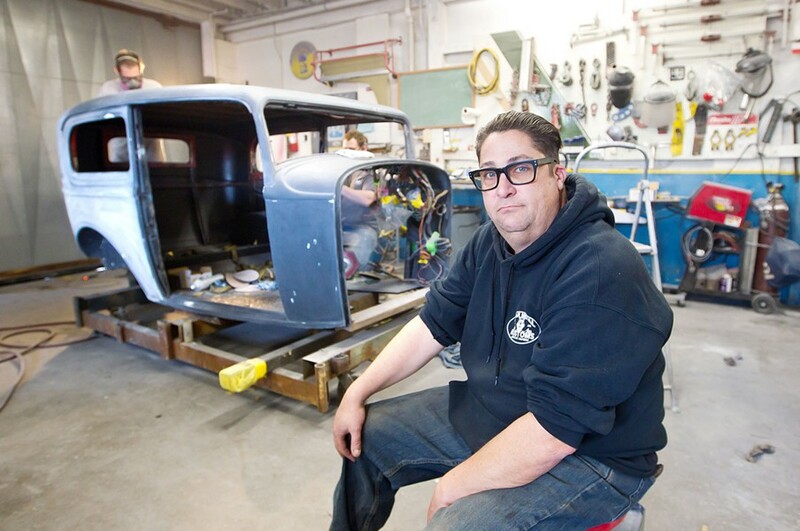 STAYING LOCAL Jason Pall, owner of Auto Body Builders, is fighting to keep his business afloat in Morro Bay. The current owner, Jason Pall, bought the business about a year and a half ago and wasn't aware of the permit's outdated status until he started dealing with a neighbor. "Before purchasing the business, I went to the city and asked them about the business and the permit. As soon as I started asking, everyone knew what I was talking about and told me, 'As long as you keep doing the same thing no problem,'" Pall said. With a new name, Auto Body Builders began operating Monday through Friday from 7 a.m. to 6 p.m.
About two days later, Pall said he started receiving complaints from the neighbor living directly behind the auto shop. "A neighbor next door that's a renter came over and said, 'Hey I don't want to be that guy but,' and that's when the complaints started," he said. The renter—who no longer lives in the home as of July 11, 2017—had an issue with the noise made by the employees, the fan on the roof, an odor, and toxins being released in the air. The complaints were first given directly to Pall and then later to city staff. City staff looked into the property and found that there was a conditional use permit that had expired in 1986. "Everything was business as usual except for this permit that got lost, wasn't reissued, and no one can really say how it happened," Pall said. To get the permit, Pall had to apply as if he were a new business, and he went through a city Planning Commission hearing on March 7; 18 neighbors and customers spoke during public comment on the shop's behalf. Four spoke against the shop. Diane Playan, who lives directly next to the auto shop, said she didn't understand where the complaints were coming from. "My window faces the area where the shop is, and I've had no issues with any smells or noise," she said. One of the four who advocated for the Planning Commission to deny the permit, Daniel Knight, argued that the shop was in a residential zone. "I ask that you do not grant this and keep the community developing as it has been around there," he said. The Planning Commission unanimously approved a conditional use permit for the auto shop, but that decision didn't sit well with the four who spoke against it. They appealed the commission's ruling, taking it to a Morro Bay City Council meeting on May 23. The Council upheld the planning commission's decision, so the Knight Clay Trust filed a legal challenge against the city of Morro Bay and Pall. There will be a hearing in the case in SLO County Superior Court on Jan. 23. Knight represents the trust and said that the challenge isn't a "full-on lawsuit, it's just a challenge to a decision that we just want the city to have all the correct information before a decision is made." A clause in the conditional use permit that Pall has for his shop requires him to cover the city of Morro Bay's city attorney expenses if it's sued over his business.